Friday 56 & #BookBeginnings: His Name Was Ben + Giveaway! It was just past three in the morning when Sara Phillips looked over to the clock on the nightstand. Tazzie, why can’t I sleep like you? Snuggling close to her Rottweiler, feeling the short black-and-tan hair on her cheek and the robust contour of the dog’s chest, she felt a comfort that she was not alone. She wondered how many pills from a nearly full bottle of Ativan in the bathroom would be needed to take her life. Her ego had built walls of protection, defense mechanisms, to avoid facing the crap she spewed to others about who she was. 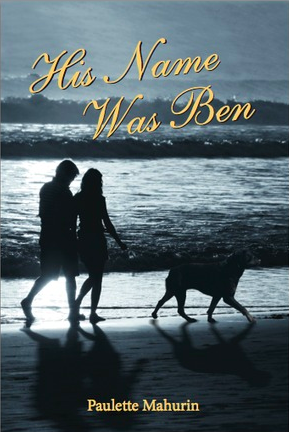 Synopsis of His Name Was Ben by Paulette Mahurin: Hearing the words “it’s cancer,” threw Sara Phillips’ life into chaos, until an unexpected turn of events and a chance encounter with a stranger changed everything—his name was Ben. Based on real events, Ben and Sara discover that when all else fails, healing can come in the most unexpected ways. Chilling and heart wrenching, His Name Was Ben is a triumph over the devastating circumstances and fear experienced when faced with a terminal illness. In this narrative, the power of love conquers shadows and transforms the very nature and meaning of what it is to be fully alive. From the award winning, best-selling author of, The Persecution of Mildred Dunlap, comes a story filled with soul and passion that will leave the reader thinking about it for days after the last page is closed. Oh it sounds so good! It's a cancer book but still I want to read it! Awesome book beginning! This sounds like a very emotional story. I have to be in the right mood to read this type of book. Wow! That's quite a beginning. The 56 definitely paints a picture as well. I'm intrigued by this one. It definitely sounds like a powerful book. Thanks for sharing! This sounds like an excellent story. The opening paragraph makes me want to read more to find out why she is feeling suicidal and the 56 makes me wonder why she has built those walls. I'd like to get to know this character better. My Friday post features NOT YET. Oh my....I need to know more. Sometimes I'm afraid of this kind of story. Brings back memories and heartache. But maybe it helps the grieving process and makes the sorrow lessen. Wouldn't take much Ativan... Sadly, I know. Not sure I could read this one. The subject matter might be too much for me. resonates with you is the way to go. I wish you well, Laura, and hope that whatever the source of your heartache is, that it finds its way to the ethers without causing you too much distress in the process. Fredamans: Thank you for bringing up Ativan, a benzodiazepine (same category drug as Valium, Librium, etc. ), a highly addictive antianxiety medication which should not be used for more than a short time in treating anxiety. There are exceptions, when it’s beneficial, for example with cancer patients, etc. I’m sorry to read what you wrote, “Sadly, I know” and hope that whatever your experience was that it’s well behind you. Again, with what I wrote above, trust your gut and if this doesn’t feel like a read for you, then it’s most likely not. And to all the rest of you who showed an interest in reading my book, thank you so much and I do hope you enjoy. Paulette, thanks so much for coming by; it is always a pleasure to host you. With a book that deals with very sensitive subject matter, I am glad that you take the time to respond to individual comments.